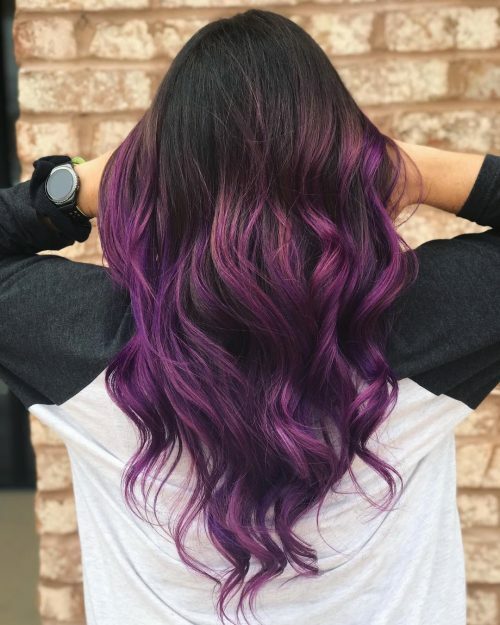 Dark purple hair is the perfect color to wear if you wanna show off your adventurous personality without getting too much on the vivid side of fashion colors. Trust me when I tell you to get excited, as there are a ton of enchanting shades in the broad spectrum of purple hues! Deep violets, although, pair most beautifully with darker and olive skin tones. 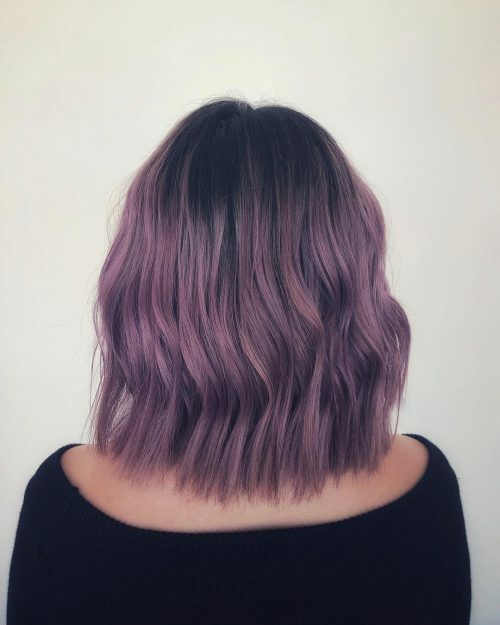 Getting pops of plum onto your hair can add depth and bring your strands to life! An almost-black purple mane has lustrous pigments that reflect light splendidly for a glossy finish. Take the plunge into this extraordinary hair color trend and experience the fun of owning a cool blackberry shade. 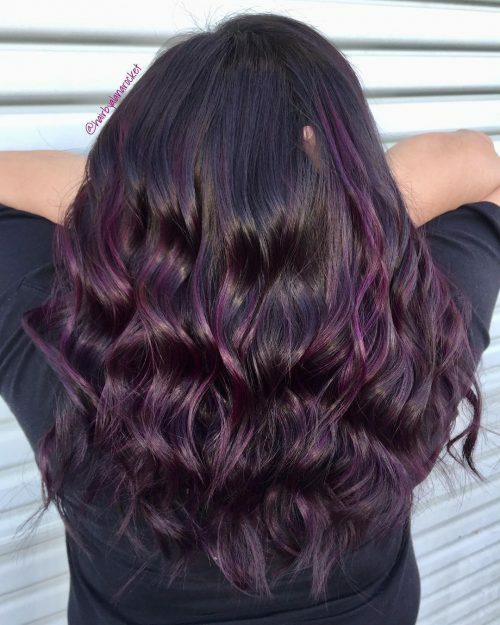 Keep on scrolling for the most popular looks of dark purple hair color ideas! 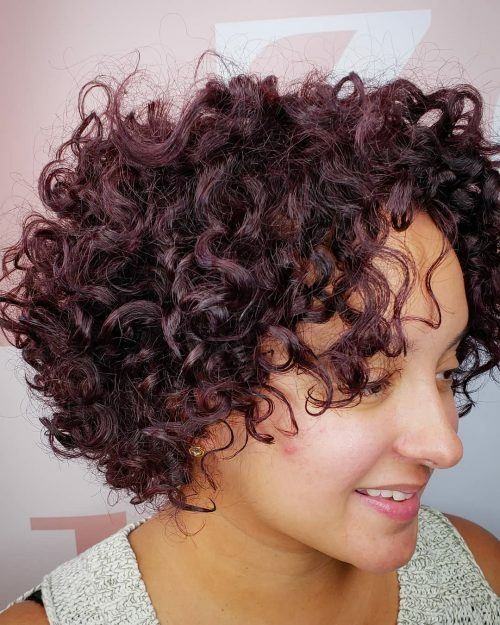 Get funkier with your lovely curls when you paint them with this defining violet hue! It allows your locks to show off their structure and makes them even shinier and healthy-looking. 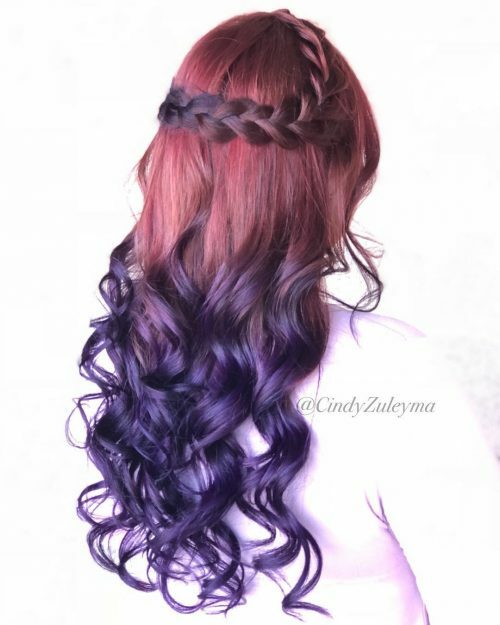 Embody a mystical feel with a magenta to violet transition that’s terrific on lengthy hair. Wear these enchanting colors that can be easily paired with messy waves and milkman braids, and you’re sure to look your most fabulous! A subtle addition to your dark locks, dark violet highlights give that extra factor of sleekness. The combination of layered waves, loose curls, and texture in this look adds depth and volume for a dazzling finish! This shade of purple is sure to turn heads. An impeccable monochrome transition from deep to pastel violet fantastic for fair to medium skin. You can choose to style it up or let it down with a few face-framing waves and fringes. An eye-catching work of art that fits fairer skin with pink undertones. These cool colors mix excellently to give beautiful dimension and improve density. 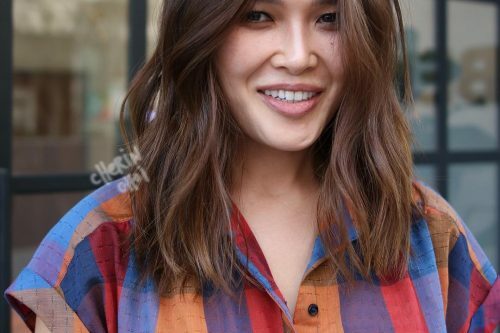 Transform your long wavy locks with this super cute and simple dye job! Start with the ends and test the waters if you wanna go slowly into getting into vivids. You can never go wrong with this rich crimson hue. The flawless transition from black to red-violet is a no-brainer and perfectly pairs up with any texture. 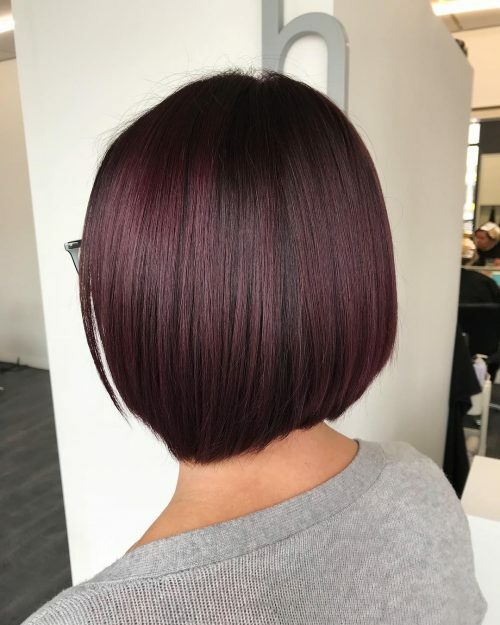 Dark roots that shift to a deep violet hue towards the end creates an ethereal finish to a simple lob. Get an instant brightening effect from this purple-red blend! Even with simple straight hair, as long as you choose a complimenting cut, this look will surely turn heads in admiration. 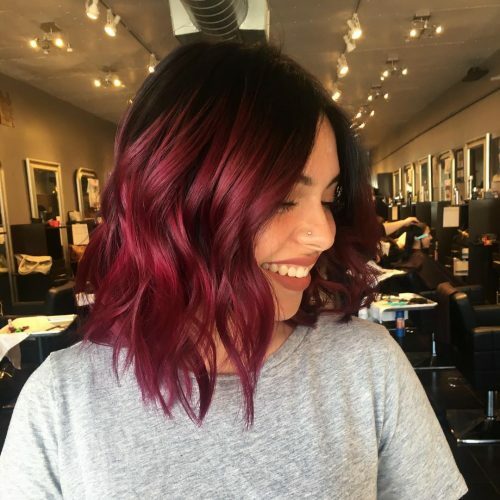 Go bold as you fashion this deep plum hue that certainly goes with any cut. 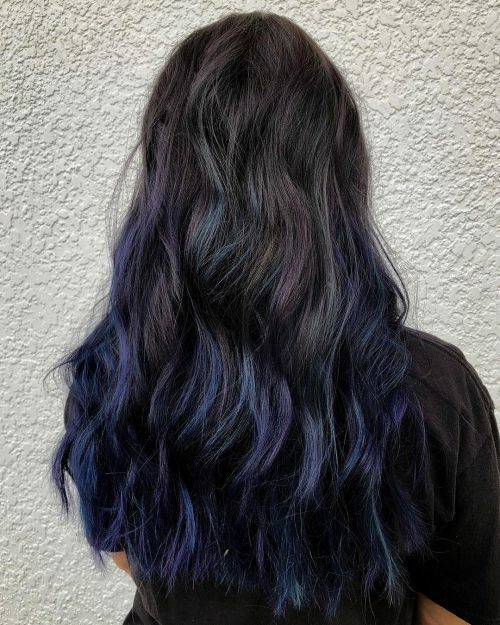 Under the light, these cool hues flash their richness along with your hair’s volume. The best thing about this overall dark purple hair color is that, even though it’s bold & fun, it’s wearable. It’s a great way for a client to try a new look and not have it be too aggressive. 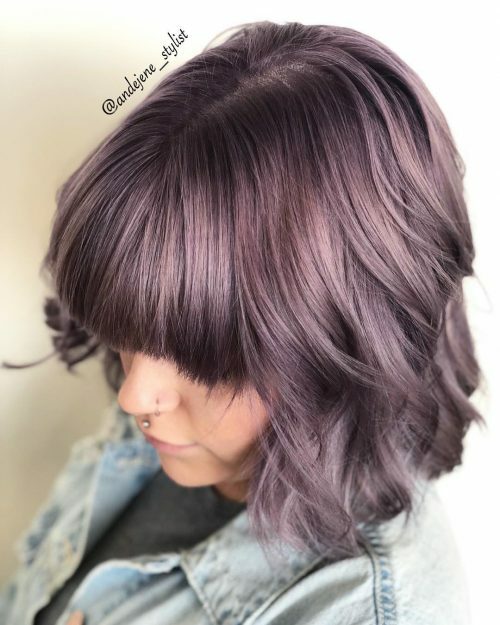 The delicate lavender/silver tones complement her cut. I chose to give her a soft lob because it’s easy to style and has a carefree vibe. 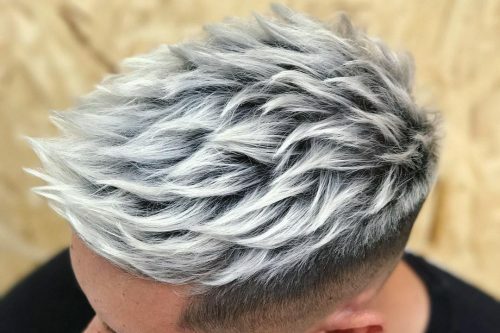 I used Guy Tang Mydentity Color, Direct Dye. I mostly used Lavender Lust injected with a little Pink Diamond. The best part about this look is it’s commitment-free (if you choose to be). Pastel colors like this are delicate which means it’s not heavy in pigment. It evolves to a very beautiful icy/beige blonde. No need to come in to have it removed. If the client wants it to last, I create a custom color conditioner that they take home and can apply themselves to refresh the color. This color and style look great on everyone. It’s so versatile. 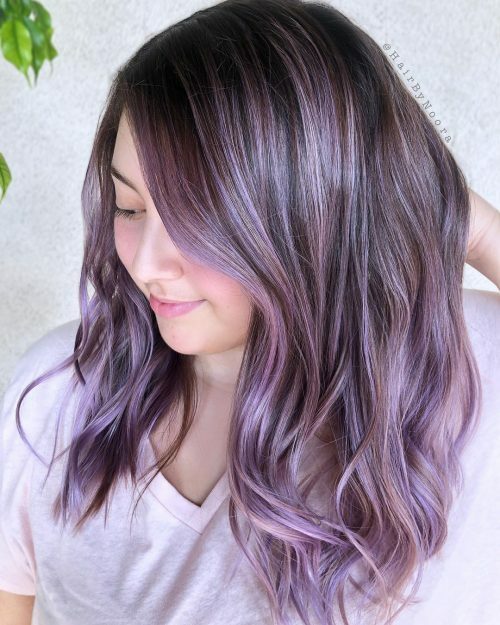 This look is a deep purple balayage. 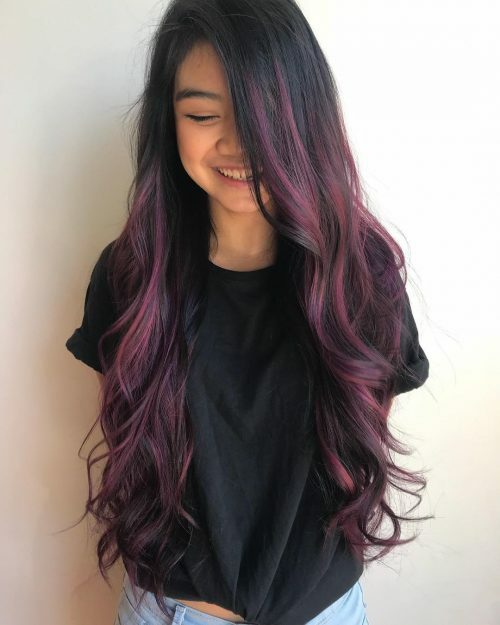 The loveliest things about this look are the blended ribbons of violet, the long blended layers for movement and easy styling, and that it looks good straight too. For anyone considering this look or a look with vivid colors, they need to be ready for the commitment. 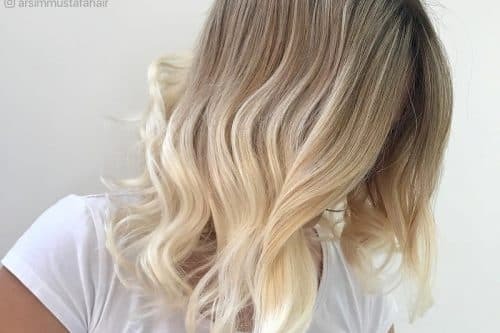 You have to use color safe shampoo and conditioner, shampoo as little as possible and with cool water, and come in for a color refresh every 6-8 weeks. 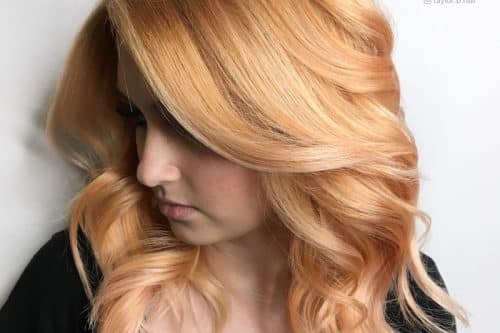 Using a heat protectant will also make the color last longer (I love shimmer shine by Kevin Murphy) and turning down the heat on your hot tools. It will strip the color out of your hair. This look can work on any hair type or face shape and the tone can easily be changed to fit your personality! 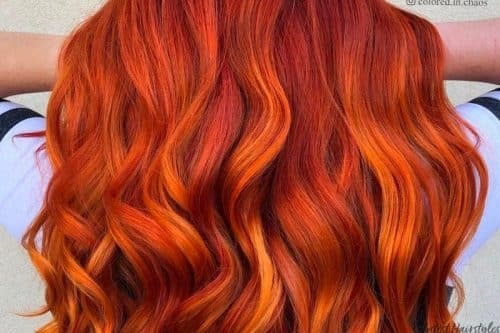 Just be aware that the more vibrant you want the color, the more you have to lighten the hair first. This model was lifted to blonde and then we deposited the purple. It’s a blackberry color balayage. I did a rich dark color. 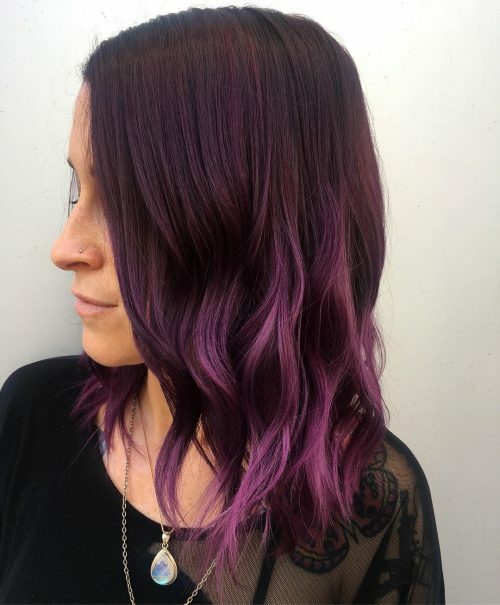 It has a brown base with Jack Winn Pro Color melted into a custom mix of Pulp Riot deep purple tones over pre-lightened hair. We did a “V-shaped” haircut with long layers for her haircut. I also used a 1.25″ long barrel curling iron for her curls and brushed them out with my fingers. To anyone considering this color these types of colors they do require specific care. A sulfate and paraben free shampoo is needed for longevity. 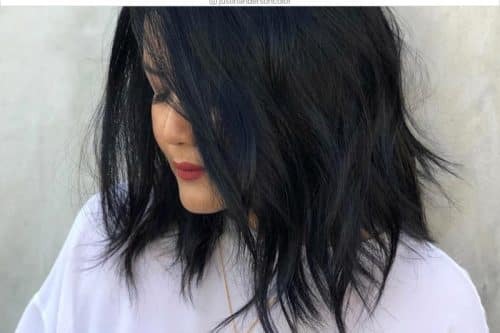 Dry shampoo is also great to assist with keeping these types of color bright because you don’t need to shampoo as often when you’re using dry shampoo. 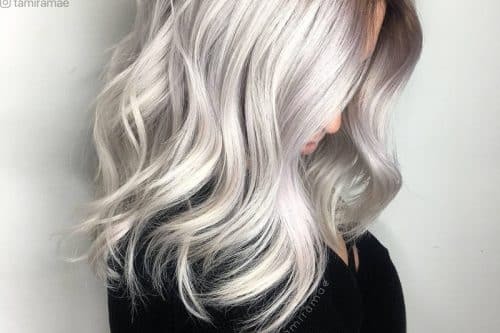 With this type of color, your hair will also need to be lightened to achieve the brightness of the purple, so they typically take around 4-5 hours for the first service. Purple is an amazing color to start with for anyone who has never had the bright vivid colors. This is more of a “subtle vivid”. 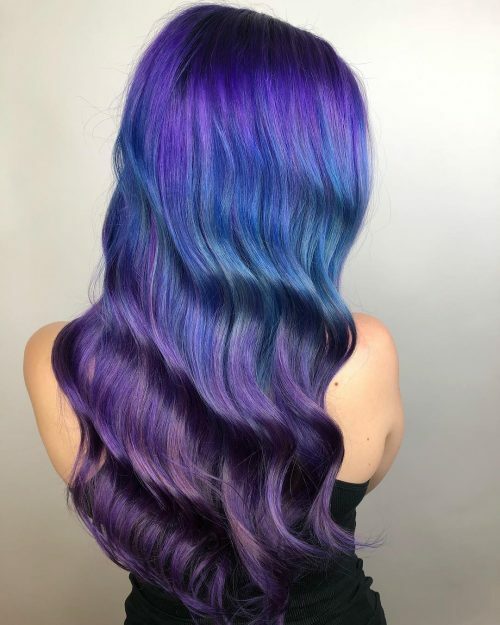 By using Pulp Riot Color Velvet and Nevermore, I was able to give her some fun color without it being too “in your face”. I put some loose waves into her hair to show off the dimension her hair has with her natural hair being very dark brown. Also, the dark purple and dark indigo colors melt perfectly into one another. This look would be perfect for the person who wants a little bit of an edgier look without having to do too much work. This is also a great look for someone who has darker hair and doesn’t want to damage their hair. Because vivids are a darker color, they do last a lot longer than a lighter color would. Also, because of it being balayaged, it will have a very nice grow out so you could go a couple months without having to color it again. I would recommend using a sulfate free shampoo such as Redken Color Magnetics to maintain the color and using a heat protector when using hot tools. What I love about this look is that almost everyone could reach it. It doesn’t matter if you have very dark hair! 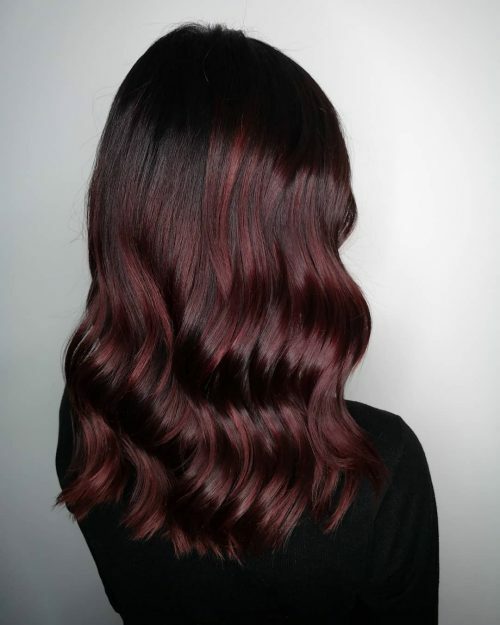 Even if this burgundy-balayage look is pretentious, it’s still classy because the contrast isn’t too huge. 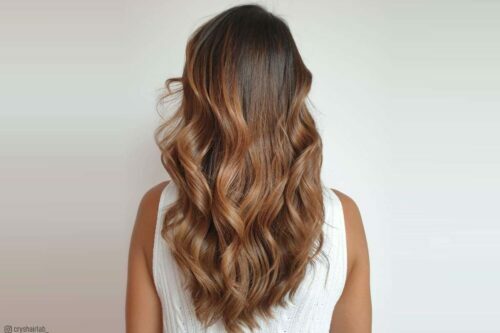 This color loves wavy or curly, super shiny styling! Think how much contrast you want. 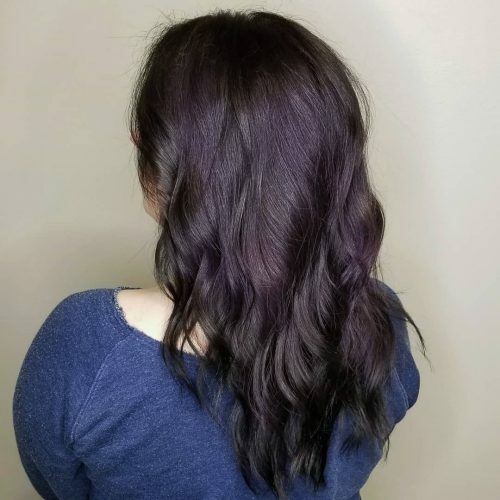 Even smaller parts or purple highlights look good on dark hair! Remember to ask your stylist tips how to add shine on your hair with styling products. 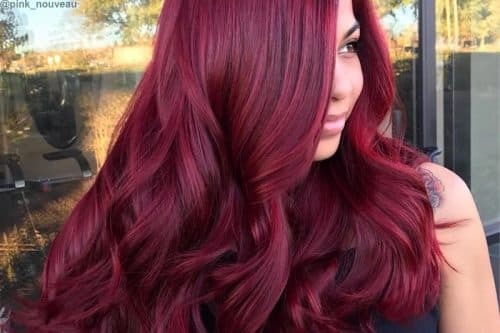 You will also need shampoo or conditioner with purple or dark red pigments to keep the color bright between your salon appointments. This look will fit everyone who wants to add ‘that something’ on their dark hair! 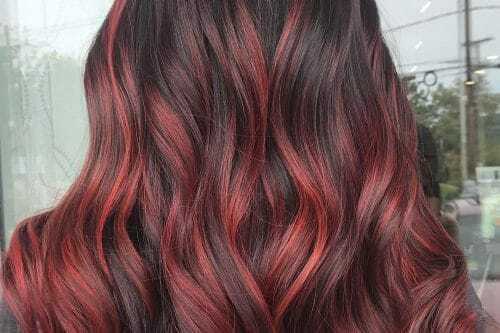 The thing I love most is how the blunt cut, the curls, and the distinguished blend between the root and end color all combine into this edgy, different, and vibrant look. I think when choosing purple/violet, you should take skin tone into account. If you have darker skin tones, any shade of purple will suit. 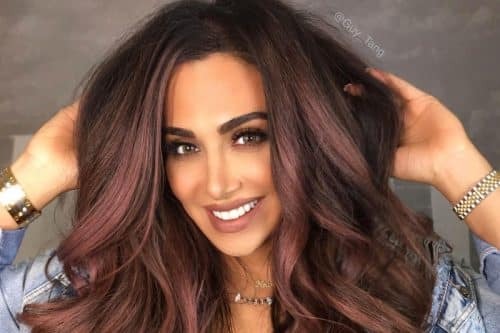 For olive skin tones, I’d opt for blue toned shades like deep purple and a darker violet, and paler tones can rock the warm and cooler purples. Although you can take any of those “rules” with a grain of salt. I always ask the client to choose a shade that makes them feel the most confident, as I feel that’s what your purple and reds represent. Majority of the time, to achieve that purple/violet look, you’re going to have to lighten your hair. 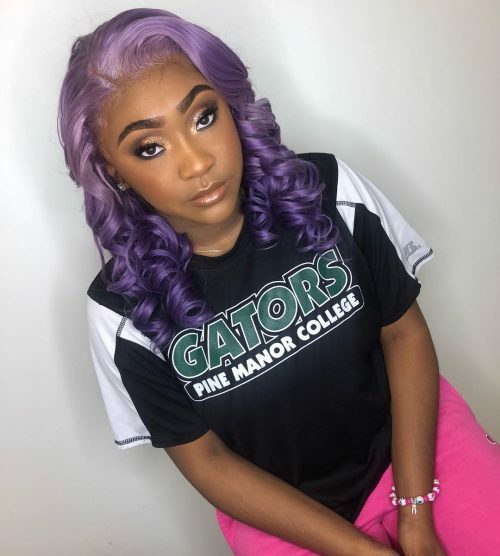 My client and I have been lightening her hair from a level 3 for about 1 year, so it’s a long process that you’ll have to stick too. Also, take care of your hair along the way. Purple is a shade that doesn’t last particularly long. It’s great! In between school breaks, you can mix it up and have a play around with some shades without it being a permanent choice. This is why we chose the color! I wanted to do a bold look for my 22nd birthday! My favorite color is purple, and I wanted to do a light to dark look. I used a platinum blonde (613 color) frontal wig from the brand Adore (my favorite brand to color hair). When coloring the wig, I used the water method – water method is heating up water, adding color into the water, then dipping the hair into the bowl. I used different amounts of the same color in the bowl to get the ombré effect. Then I had a hair stylist install the wig on me. Overall the loveliest part of this look was the wig! I got it from a company called Junor’s Journey! (@junorsjourney on Instagram and www.junorsjourney.com on the web). The body wave (human hair) frontal wig was amazing! This is a look that I recommend if you want to make a statement! 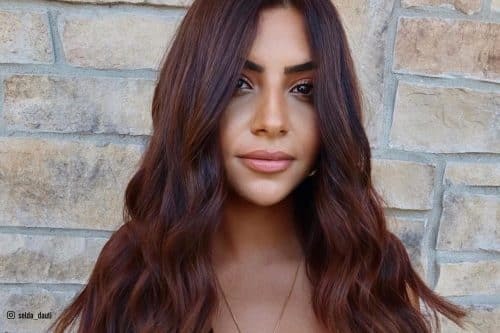 This dark purple hair color will pop on any skin tone! No one is too dark or too pale to do this color, so I recommend anyone to go for it! To get this look, your hair color must be platinum blonde (613) first! If you don’t want to add all those chemicals to your hair then I recommend to get a wig and try it out! You can put it on and take it off any time you want (if you have a job that requires you to have natural looking colors, getting a wig is highly recommended)! I do recommend getting the hair from the company Junor’s Journey and using the Adore brand lavender! This look is an asymmetrical pixie bob. The back is cropped short like a pixie but gradually lengthens around the top and sides to create the distinctive shape. 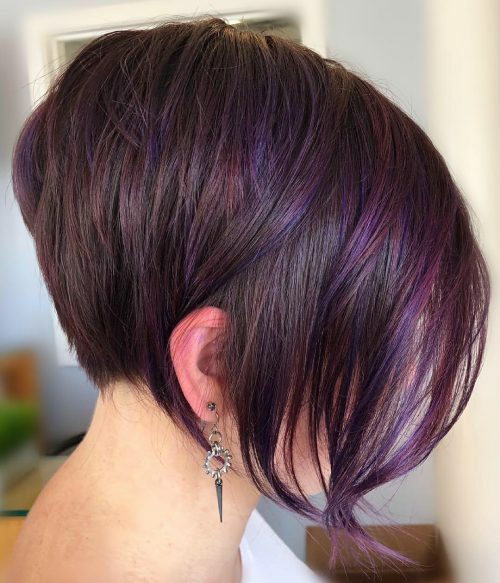 This particular client is growing out a short pixie hairstyle and this cut is my favorite way to ease into the transition. The back is kept short while the front and sides grow longer. Once the area behind the ear reaches the same length as the front we can begin the grow the back out into a little bob and on from there. 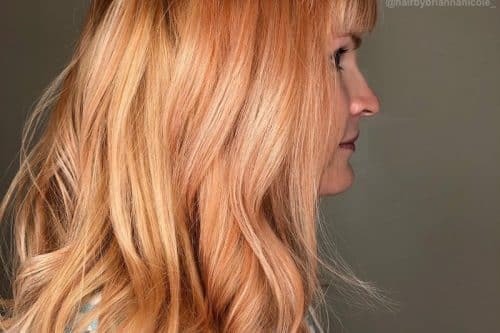 The color was achieved by doing a light balayage using Oligo Clay Lightener and then coloring over the entire head with a mix of direct deposit hair colors by Joico. 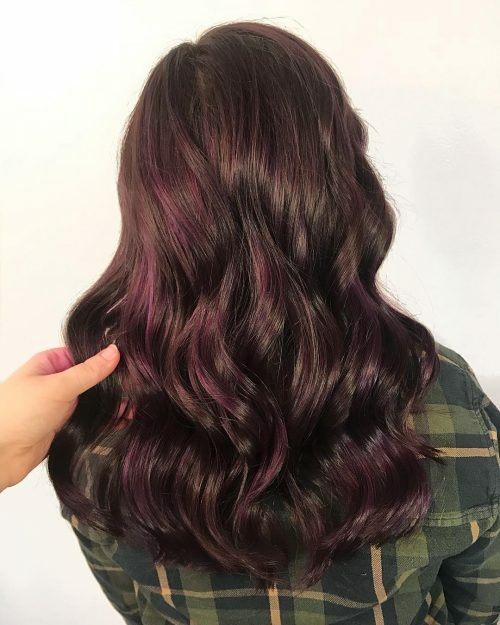 I love how the purple and red tones appear brighter on the highlighted sections but softer on her natural medium-brown color. The color can appear softer in indoor lighting but brighter outside in direct sunlight which makes this look perfect for someone who wants a bright fashion color but still wants to be work appropriate. 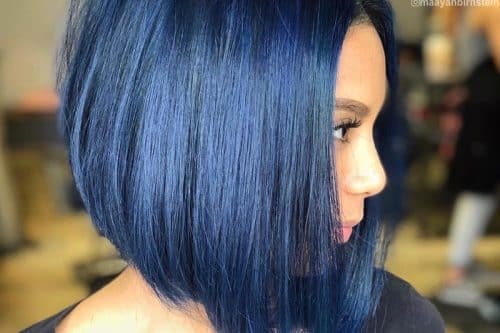 A color like this using direct dye will always fade more rapidly than permanent hair color, so at-home maintenance is key. I recommend my clients wash their hair as infrequently as they can be based on hair texture and body chemistry, and when they do wash, use a color-safe, sulfate-free shampoo and cold to lukewarm water. 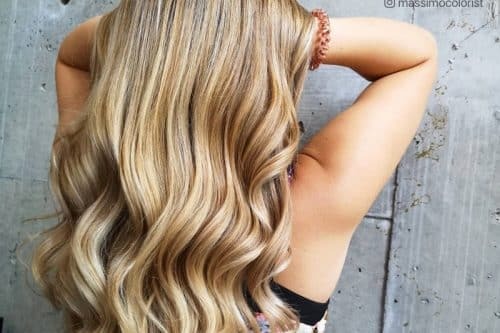 This kind of color will gradually lose vibrancy and will need touching up every 4 to 6 weeks – could be longer depending on how often they wash their hair. The cut also requires a little more maintenance as the back will grow out faster than the sides and require cleanup. 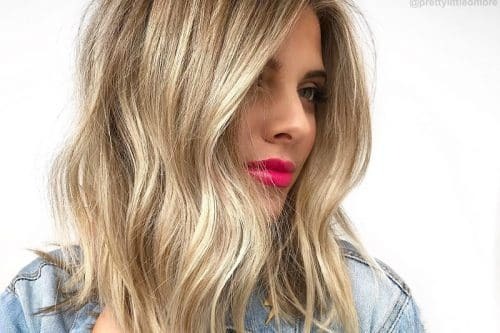 A client considering this style should expect to spend a little more on quality shampoo and be prepared for frequent salon visits to maintain the color and cut. I love this style for my clients with fine-textured hair who want something wearable enough for every day but still fun and edgy. The color line I used was Matrix ColorSync Watercolors. I applied it onto her hair which was pre-lightened to a pale blond. It’s seriously the perfect smokey lavender/mauve. The cut is a very simple blunt bob with a heavy Betty Paige inspired fringe. It’s an extremely versatile cut in how it can be styled curly or straight, but I love curls, obviously. Hair for everyone – meaning if you love it then try it! 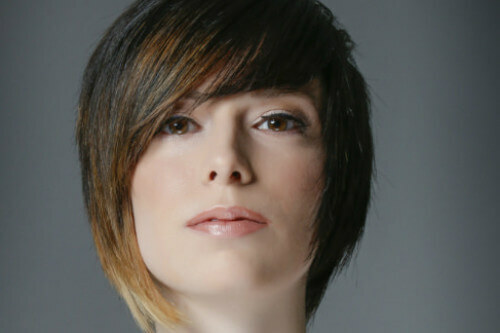 Don’t be afraid to try the bold fringe, the bright color, or even a different cut. Everything is in and it’s all a matter of personal taste. If you love it, that’s all that matters. For this particular style you are going to need a good blow dry lotion, I suggest and love Biolage Blowdry Glotion. It protects the hair up to 450, speeds drying time, and controls manageability. A great texturing spray is Joico Body Shake Texturizing Finisher for fine to medium hair which works for all hair types.